The 5G10 Mini-Ohm wirewound axial leaded through-hole resistor series from General Resistance offers ultra-precision and excellent long term stability over temperature and time, with a resistance range from 1Ω up to 200kΩ. The 5G10 Mini-Ohm series utilises the highest quality copper alloy drawn from melts of known resistivity and controlled temperature coefficients. The windings are balanced multiple π for low reactance. Together these enable the 5G10 Mini-Ohm series to have excellent noise levels and lower TCR of ±5 ppm/°C maximum (from -55°C and +125°C). 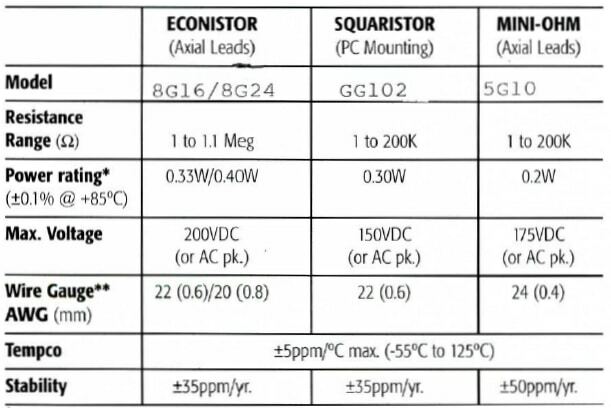 The General Resistance ultra-precision wirewound axial leaded resistor series have been used for over 50 years in precision measurement instruments by manufacturers around the world, and should be specified whenever precision circuit operation is to be maintained over a prolonged period of time. The 5G10 Mini-Ohm series offers ultra-precision in a small compact through-hole package, making them the ideal solution for test and measurement applications including test and calibration equipment. Any custom resistance value can be produced with a low minimum order requirement of 10 pcs for non standard product. The 8G16 Econistor wirewound axial leaded through-hole resistor series from General Resistance offers ultra-precision and excellent long term stability over temperature and time, with a resistance range from 1Ω up to 699kΩ. The 8G16 Econistor series utilises the highest quality copper alloy drawn from melts of known resistivity and controlled temperature coefficients. The windings are balanced multiple π for low reactance. Together these enable the 8G16 Econistor series to have excellent noise levels and lower TCR of ±5 ppm/°C maximum (from -55°C and +125°C). The General Resistance ultra-precision wirewound resistors have been used for over 50 years in precision measurement instruments by manufacturers around the world, and should be specified whenever precision circuit operation is to be maintained over a prolonged period of time. The 8G16 Econistor series are the ideal solution for test and measurement applications including RTD temperature simulation resistors and test and calibration equipment. We stock 21 Pt100 simulation resistance values as standard here at Rhopoint Components, with temperatures from -100°C up to +400°C. Any custom resistance value can be produced with a low minimum order requirement of 10 pcs for non standard product, this includes additional RTD simulation values that are not standard stocked items. The GG102 Squaristor wirewound radial leaded through-hole resistor series from General Resistance offers ultra-precision and excellent long term stability over temperature and time, with a resistance range from 1Ω up to 200kΩ. The GG102 Squaristor series utilises the highest quality copper alloy drawn from melts of known resistivity and controlled temperature coefficients. The windings are balanced multiple π for low reactance. Together these enable the GG102 Squaristor series to have excellent noise levels and lower TCR of ±5 ppm/°C maximum (from -55°C and +125°C). The General Resistance ultra-precision wirewound resistor series have been used for over 50 years in precision measurement instruments by manufacturers around the world, and should be specified whenever precision circuit operation is to be maintained over a prolonged period of time. The GG102 Squaristor series offers ultra-precision in a small compact radial leaded through-hole package, making them the ideal solution for test and measurement applications including test and calibration equipment. Any custom resistance value can be produced with a low minimum order requirement of 10 pcs for non standard product (30 pc minimum order quantity for standard parts). The 5E10 Mini-Ohm wirewound axial leaded through-hole resistor series from General Resistance offers ultra-precision and excellent long term stability over temperature and time, with a resistance range from 1Ω up to 200kΩ. The 5E10 Mini-Ohm series utilises the highest quality copper alloy drawn from melts of known resistivity and controlled temperature coefficients. The windings are balanced multiple π for low reactance. Together these enable the 5E10 Mini-Ohm series to have excellent noise levels and lower TCR of ±5 ppm/°C maximum (from -55°C and +125°C). The 5E10 Mini-Ohm series offers ultra-precision in a small compact through-hole package, making them the ideal solution for test and measurement applications including test and calibration equipment. The 8E16 Econistor wirewound axial leaded through-hole resistor series from General Resistance offers ultra-precision and excellent long term stability over temperature and time, with a resistance range from 1Ω up to 699kΩ. The 8E16 Econistor series utilises the highest quality copper alloy drawn from melts of known resistivity and controlled temperature coefficients. The windings are balanced multiple π for low reactance. Together these enable the 8E16 Econistor series to have excellent noise levels and lower TCR of ±5 ppm/°C maximum (from -55°C and +125°C). The 8E16 Econistor series are the ideal solution for test and measurement applications including RTD temperature simulation resistors and test and calibration equipment. We stock 21 Pt100 simulation resistance values as standard here at Rhopoint Components, with temperatures from -100°C up to +400°C. Any custom resistance value can be produced with a low minimum order requirement of 10 pcs for non standard product, this includes additional RTD simulation values that are not standard stocked items (30 pc minimum order quantity for standard parts). The GR102 Squaristor wirewound radial leaded through-hole resistor series from General Resistance offers ultra-precision and excellent long term stability over temperature and time, with a resistance range from 1Ω up to 200kΩ. The GR102 Squaristor series utilises the highest quality copper alloy drawn from melts of known resistivity and controlled temperature coefficients. The windings are balanced multiple π for low reactance. Together these enable the GR102 Squaristor series to have excellent noise levels and lower TCR of ±5 ppm/°C maximum (from -55°C and +125°C). The GR102 Squaristor series offers ultra-precision in a small compact radial leaded through-hole package, making them the ideal solution for test and measurement applications including test and calibration equipment.